Pennsylvania voted for the Republican nominee, incumbent President Benjamin Harrison, over the Democratic nominee, former President Grover Cleveland, who was running for a second, non-consecutive term. Harrison won Pennsylvania by a margin of 6.36 percent; however, this remains the last occasion a Democratic candidate has ever won northeastern Wayne County, which had regularly voted Democratic during the Third Party System. 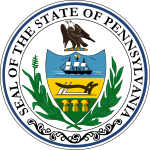 With 51.45% of the popular vote, Pennsylvania would prove to be Harrison's fourth strongest victory in terms of percentage in the popular vote after Vermont, Maine and Massachusetts. This page was last edited on 29 December 2018, at 16:11 (UTC).